Africa's Anglican bishops have resolved to stop receiving donations from western congregations which support the ordination of gay bishops. 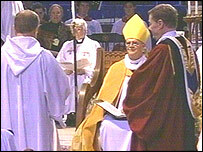 The bishops also made clear that they would continue to accept funding from what they termed people of good faith. 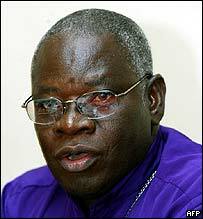 Nigerian Archbishop Peter Akinola said they would not sacrifice their faith and conscience on the altar of money. Although two-thirds of Anglicans are in the developing world, the wealth of the church still resides in the West. The work of African churches is, to a large extent, funded by donations from rich Western congregations. Archbishop Akinola said that if the Anglican Church in America offered money to help the poor in his province he would turn it down. "Money can't buy us. There is no price tag on our heads. Money is not everything" he said after a meeting of African, Asian, Caribbean and Latin American bishops in the Kenyan capital Nairobi. African churches had to break their dependency on donations from the West, he added. "To gain our independence and our freedom, we have to suffer for a while," the archbishop said. "We will not, on the altar of money, mortgage our conscience, mortgage our faith, mortgage our salvation." The BBC's Ishbel Matheson in Nairobi says Anglican church leaders in Africa find themselves in a tricky position - most have condemned the ordination of the gay bishop Gene Robinson in America but they would find it hard to completely cut themselves off. In Africa's slums and in impoverished rural areas, religious organisations provide vital medical and social services. Archbishop Akinola also said they would take "action they deem necessary" if the US Church failed to "repent" over the ordination of homosexuals within the next three months.